Scientists recently used CRISPR/Cas9 to disrupt a gene necessary for female development in the spotted wing Drosophila, a fruit pest. This caused the female flies to die early. However, such modified organisms are currently not released into the wild because it is not known if any unintended effects could occur. For example, other organisms of the species could gain resistance to this technology by slightly changing their DNA. 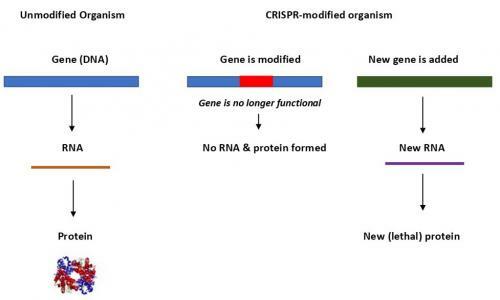 Or CRISPR/Cas9 could shut down the wrong gene or act on non-pest species with similar genes. Figure 1. A CRISPR-Cas9 system can be used to either a) prevent an important protein from being formed or b) create a protein which is deadly to the organism. 2. RNA interference (RNAi) system has been observed in many non-bacterial species, including plants and animals. It is also used as a defense against viruses. RNAi shuts down RNA; the DNA and genes are unaltered. When an organism’s RNA is shut down, it can no longer form protein and could kill an organism. For example, scientists developed corn which contain RNAi that targets western corn rootworm. When the pest ingests the corn, they can no longer form a critical protein and most die within 12 days. 3. Nanopesticides are pesticides which are incorporated within nanoparticles. Nanoparticles are very small molecules (billionth of a meter) that are usually made from metals. As smaller-sized particles cover a larger surface area, lower rates of nanopesticides would need to be sprayed in the field. Also, a greater surface area increases contact with pests. Nanopesticides do not break down easily. Thus, unlike traditional pesticides, they need not be applied frequently. And potentially, they could be encased in capsules that penetrate and enter pests more effectively than non-pest species. These properties could lower overall amounts of pesticides in the environment and/or reduce exposure to non-pests. Nanosilver, the first nanopesticide, has been applied in plants to reduce rates of fungal root diseases. However, there are several unresolved issues. Since nanopesticides are more stable, they could persist in the environment for longer than required. And we do not know how they move - for example, do they stick to crops or do they slide off it and enter the soil or water and affect other organisms?